Adult: Uniformly very dark brown with rectangular bodies. Thorax: Lateral margins are lined with numerous tiny spines. Antennae: Long and thin. Larvae: Full grown larvae are thick-bodied, creamy white with a reddish-brown head bearing four toothlike processes just above the mandibles. California Prionus (Prionus californicus) is similar in size, but is not as dark brown as T. spiculatus. Also, the antennae in P. californicus is pectinate. Grubs are found chiefly in Ponderosa Pine and Douglas Fir, but will also attack oak, madrone, poplar, apple, cherry, walnut, chestnut and some eucalyptuses. Adults fly from June to September and may be attracted to lights in wooded areas of Oakland. Females lay eggs in basal crevices of dead or dying trees. Larvae excavate very large, meandering galleries, first in the sapwood then deep into the heartwood. The life cycle is presumed to require several to many years. 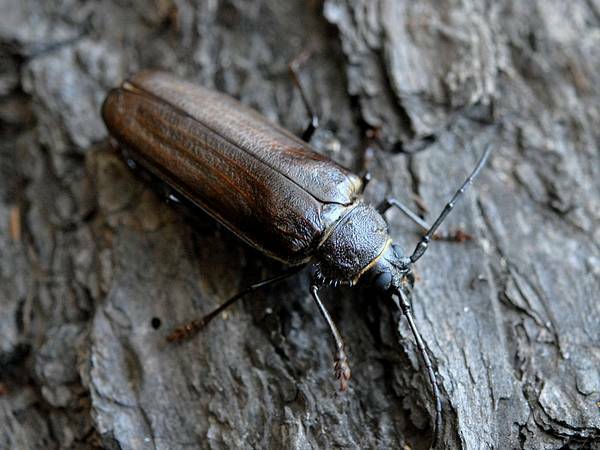 This insect plays an important role in fire ecology. Larvae, known to loggers as "timberworms", feed on trees that are already dead or dying. Feeding weakens tree reducing standing fuel available during fires. The mandibles of this beetle’s grub is said to have been the inspiration for the modern chainsaw.